I’m back in London, but half of my heart stayed in Paris. We took these photos last Sunday on Liverpool Street. I like to compare different cities. So when it comes to London you can’t even know if it’s a working day or Sunday. It is always busy, people work (hard) here every day. See those running people behind me. Maybe that’s why I sometimes forget what day it is today… I don’t really count them. In Paris it’s different. Sunday is a day when people stay at home and can take a rest. Like in Poland, I would say. The streets are almost empty. We wanted to buy a fresh baguette in Paris on Sunday, but most bakeries were closed. Since I moved to London I forgot that groceries can be closed. Shame on me! Back to my outfit. I was wearing Sandro sweatshirt which I also spotted on Stockholm Streetstyle in Paris two weeks ago, a black pleated skirt, Sophie Hulme tote and Kurt Geiger boots. And I promise you (and myself as well) that I will try to wear more colorful clothes next month, not only black. Beautiful outfit!! One of my fav place in London!! I also love comparing cities! I just returned from a trip split between Paris and London and the differences are quite shocking really. I got so used to the super fast metro in Paris and the tube felt so slow, London is so much larger it just takes that much longer to get everywhere. Love your outfit, it looks like what all the fashionable girls were wearing in both cities actually. here you have a new post on my blog, regards!! Fantastyczna torba, pasuje idealnie do stylizacji. I think black suits you just great! Piękny outfit, torebka do pozazdroszczenia! Podoba mi się fason spódniczki w zestawieniu z botkami. Londyn jest fantastyczny. Tak, koniecznie dodaj kolorowy set. You have an amazing style!! Love this look! in love with the top!! gorgeous, I really love that sweater! I love the look! 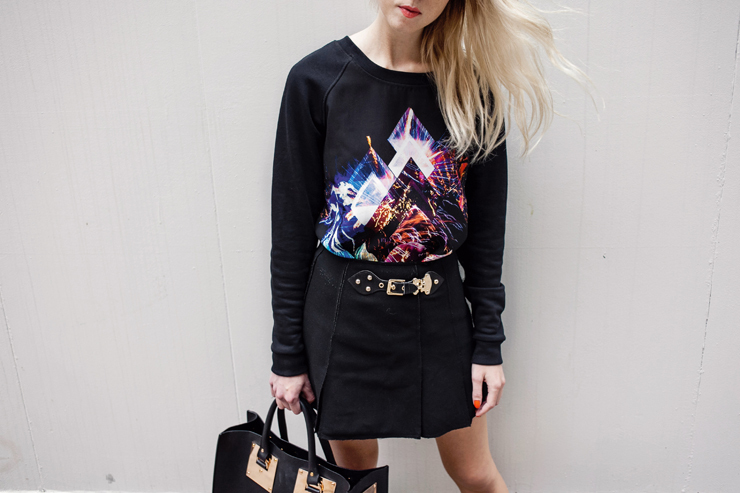 The bag and the skirt are fabulous! This is the kinda outfit which makes your blog one of my favorites. Don’t even know if I would wear it myself. But in my opinion, it’s a typical Alice outfit. Looking good girl! I love your style – simple but eye-catching. And I also love black! Torba – my must have from now on!